When I was researching Regensburg as a possible destination for our European honeymoon, I kept seeing it referred to as “Germany’s best-preserved medieval town”. Hmm…now that’s a lot to live up to. Somewhat skeptical, but still intrigued, I added Regensburg onto our itinerary. I went to Regensburg expecting to be transported back to another time and, well that’s exactly what happened. Walking the narrow lanes, there was no doubt that Regensburg had a rich history. We saw remnants of its Roman beginnings, its medieval importance, and its modern vibrancy. What stood out the most though, was the attention to detail. Throughout town we saw many beautiful clocks, murals, doors and signs. As we wandered I was always looking around, looking up, eagerly anticipating the discovery of one of Regensburg’s uniquely detailed touches. 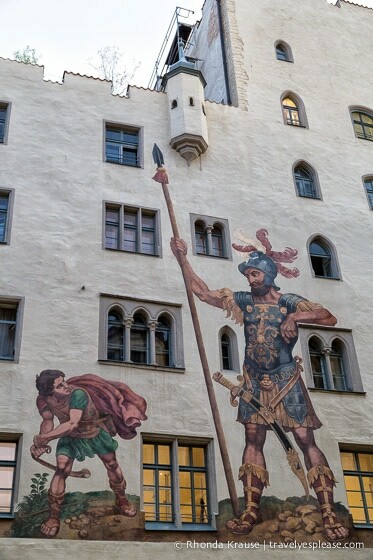 “Goliath House” with its painting of David & Goliath done in 1573. Notice that creepy looking head on the sign? Regensburg is best enjoyed by simply walking. There is plenty to see and do, but we didn’t rush around trying to see certain things. Instead, we discovered them as we went on a self-guided walking tour of Regensburg. Here’s a look at what we discovered during our visit to the World Heritage listed city of Regensburg! Dominating Regensburg’s skyline is St. Peter’s Cathedral. No matter where we were, we always used the cathedral’s twin spires as a landmark to keep us from getting lost in the web of Regensburg’s narrow lanes! St. Peter’s Cathedral was built from about 1260-1520, replacing earlier churches that occupied this site in the heart of the Old Town. The cathedral is widely considered to be the best example of Gothic architecture in Bavaria. For me, the interior of the church wasn’t all that unique. It was very dark and nothing specific really caught my eye. However, I must give credit to the stained glass windows. Many have survived from the Middle Ages fully intact! Most of the windows were donated to the church from 1320-1370, but there are a few dating back between 1220-1230. Although the interior didn’t “wow” me, I was a fan of the exterior architecture. There are many sculptures decorating the building, but most richly ornamented is the west portal. The elegant arches and canopies were almost overwhelmed by small statues of kings and saints, along with sculptures of biblical scenes. It was definitely a feast for the eyes! Just north of the cathedral is the Porta Praetoria, an ancient arched gate that survives as a reminder of Regensburg’s Roman heritage. The stone gate was built by Emperor Marcus Aurelius in 179 A.D. It served as the northern entrance to the Castra Regina fortress. Regensburg’s stone bridge is a must-see when visiting the city. A medieval masterpiece, the bridge is Germany’s oldest vaulted stone bridge. It was built between 1135 and 1146 and has many sections still in their original state. The stone bridge is 310 metres long and 7 metres wide, at one time making it the largest of its kind in the world. It also was the only stone bridge crossing the Danube between Ulm and Vienna for over 800 years! The best views of the bridge and the Old Town are from across the river, opposite the lookout tower. I took so many photos from this spot because I couldn’t get over how perfect the scene was! I loved how the bridge leads your eye towards the historic Old Town, the lookout tower and cathedral’s spires taking centre stage. We spent a good amount of time just lingering by the river, watching the ducks swim across the colourful reflections cast by the historic buildings opposite us. Right next to the Stone Bridge is Regensburg’s historic sausage kitchen, Wurstkuchl. For nearly 900 years, this kitchen has been serving homemade sausages. Back in the Middle Ages, dock workers and stonemasons would take a break from building the bridge to have a meal here. When we got to Wurstkuchl, we weren’t hungry so unfortunately we didn’t even try the sausage. I know, I know, we’re terrible! Mike did try some of Regensburg’s famous sausages from a different vendor later in the day though and he loved them! The Old Town Hall was, for us anyways, the most interesting place in Regensburg. The building dates back to the 13th century and was the fixed venue for the Imperial Diet of the Holy Roman Empire from 1663-1806. Since you can only visit the inside as part of a tour, we decided to sign up for one. I usually prefer to explore places on my own, but this tour was excellent. Our guide was very informative, telling us a bit about the history of the building, sharing stories about what went on here and pointing out some of the architectural details. The interior of the Old Town Hall is very beautiful, especially the wooden ceilings. The main halls remain medieval in appearance, but we really felt like we were in the Dark Ages when we visited the torture chamber. I kid you not- there is a torture chamber in the Town Hall! The justice system was, for lack of a better word, really crazy back in medieval times. Before a person could be punished/sentenced to death, the judge needed to hear a confession from the accused if there were no witnesses to the crime. We got to see all the devices that were used to torture people into a confession, whether they were guilty or not. After they confessed, all torture had to stop immediately. It was really interesting (and a bit uncomfortable) to think about what these people had to go through. Wow- were they brutal back in the day! I decided not to include any pictures of the torture chamber and jail cells because if you ever go on the tour I want you to be surprised! Stadtamhof is the area across the bridge from the Old Town of Regensburg. It used to be an independent town but was incorporated into the city of Regensburg in 1924. Stadtamhof is included in UNESCO’s World Heritage Site designation along with the Old Town of Regensburg. If you have the time, I’d recommend you visit this part of Regensburg. It was quiet, without a lot of other tourists. We enjoyed a nice walk along the river before exploring the streets a bit. The main avenue is lined with colourful buildings on both sides, housing restaurants and shops. We also discovered more pretty clock towers! We were extremely impressed with Regensburg and had a nice leisurely day walking around the Old Town. The thing I remember most about Regensburg was the details. I loved the clocks, doors, murals and the wrought iron signs. It was fun to always be on the lookout for an interesting little detail here and there! Although there was one more thing I would have liked to see, Thurn and Taxis Palace, I thought a full day and night was sufficient for visiting Regensburg. Even with only one day in Regensburg, I still managed to take a lot of photos. Here are a few more pictures to inspire a visit to Regensburg on your next trip to Bavaria! Regensburg is located in Bavaria, almost midway between Munich and Nuremberg. Regensburg Cathedral is open 6:30 am- 6:00 pm (April 1- October 31) and 6:30 am-5:00 pm (November 1- March 31). The Wurstkuchl historic sausage kitchen is open 7 days a week. Access to the Old Town City Hall is by guided tour only (fee applies). English tours are at 3:00 pm (April-October) and 2:00 pm (November, December and March). You can find the Porta Praetoria just north of the cathedral, on Unter den Schwibbögen. For your convenience, here is a list of hotels in Regensburg. Please consider booking your Regensburg accommodations through the included link. It costs you nothing extra and helps support this website. Thank you! Linda Bibb - We recently returned from a 15-day river cruise that included a stop in Regensburg. Your article brought back so many wonderful memories from our visit. It’s such a cool city! Frank - Love Regensburg! Went there a few years ago and have been meaning to go back.